Keep your facial fuzz in tip-top condition with The Beardy Beloved Beard Care Starter Kit from Men Rock. 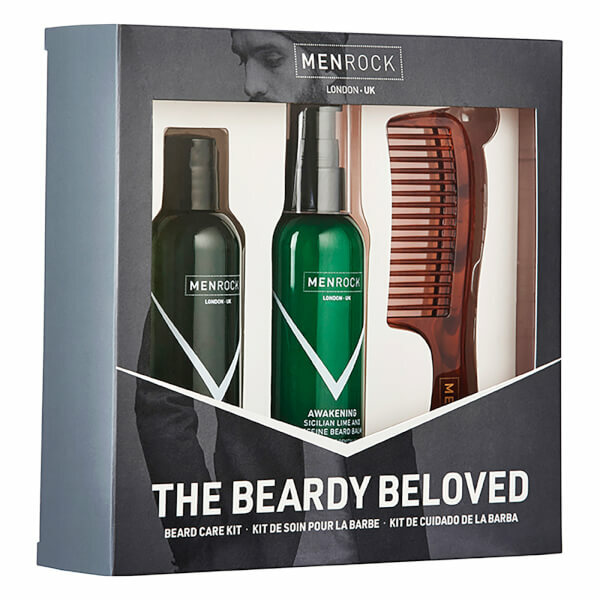 Housed in a gift box, the set includes everything you need for a cleansed, perfectly groomed beard. A leave-in conditioning balm with the brand's signature Sicilian Lime scent to revitalise the senses. Lightweight and non-greasy, the creamy formula moisturises and softens, whilst soothing itching and irritation for long-lasting comfort. A dose of Caffeine will kick-start your day. A cleansing and invigorating formula that effectively eliminates impurities from your facial hair, without drying out the skin beneath. 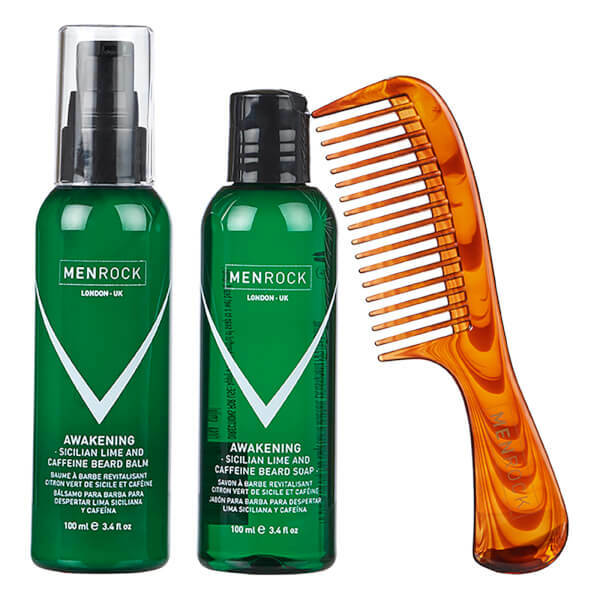 Infused with Caffeine and Men Rock's zesty fragrance of Sicilian Lime, the soap softens and energises your beard to leave it feeling fresh around the clock. 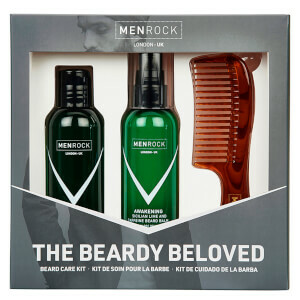 A must-have tool for taming and grooming your facial fuzz. Designed with an ergonomic handle and wide teeth, the comb glides effortlessly through your beard without snagging to leave it calm and manageable. Can be used on beards, moustaches, sideburns and bushy eyebrows. Balm: Massage a small amount into a cleansed, towel-dried beard. Soap: Apply a small amount to a wet beard, lather, rinse. Balm: Aqua, Aloe Barbadenis [Aloe Vera] Leaf Juice, Cetyl Alcohol, Behentrimonium Chloride, Dimethicone, Parfum, Helianthus Annuus [Sunflower] Seed Oil, Hydrolysed Wheat Protein, Calcium Pantothenate, [Vitamin B5], DMDM Hydantoin, Decyl Glucoside, Citric Acid, Menthol, Caffeine, Benzyl Alchohol, Citral, Coumarin, Eugenol, Geraniol, Limonene, Linalool, Alpha-iso-Methylionone, Dl-Citronellol. Soap: Aqua, Sodium Lauryl Sulfoacetate, Disodium Laureth Sulfosuccinate, Cocoamidopropyl Betaine, Polyquaternium-7, Lauroyl Sacossinate, Glycerin, PEG-150 Distearate, PEG-40 Hydrogenated Castor Oil, Parfum, Tocopherol (Vitamin E), Caffeine, Chloromethylisothiazolinone, Methylisonthiazolinone, Coumarin, Alpha-iso-Methylionone.